”, I continue to be lured by images of smokey alleyways and local tea houses. The type of tea houses that also sell simple dumpling and noodle dishes. Where one can sit, sip tea and slurp noodles with locals about to start or end their day. Some are affiliate links but prices remain the same for you, as always.
. This area is what many consider the last vestiges of old Hong Kong. It has a more local feel. Just across from our hotel, on Tai Kok Tsui Road, one can still spend a few minutes negotiating with a lady that butchers cooked meats for a living. A scene in which I took part in our last visit to the street. The marinated pork loin hung there by a hook, as to let the fat drip off. It glistened there waiting for someone to be intrigued enough to purchase a kilo or two. In nearing the stall, I was quickly approached by a woman with an apron and a cleaver. In her best English asked me, “You won’t try?”. The answer, of course, was a definitive, “yes”. She took her cleaver, puts a few pieces of the beautifully marbled pork on her cutting board, and without asking how much I’d like, started to slice. The amount she had cut seemed too much to consume by three people. But before I can stop her, my daughter and wife chime in and quickly add to the order. With an almost dry smile toward me, as if I didn’t know any better, she continues to slice and chop, not only the roasted pork loin but also a bit of duck and roasted crispy pig. This is the experience we had gotten accustomed to during our stay in Mongkok. If you are ever in Mongkok, be sure to search out the roast meat stand across the Dorsett Hotel, where we stayed and say hello to the lady with the cleaver for me. 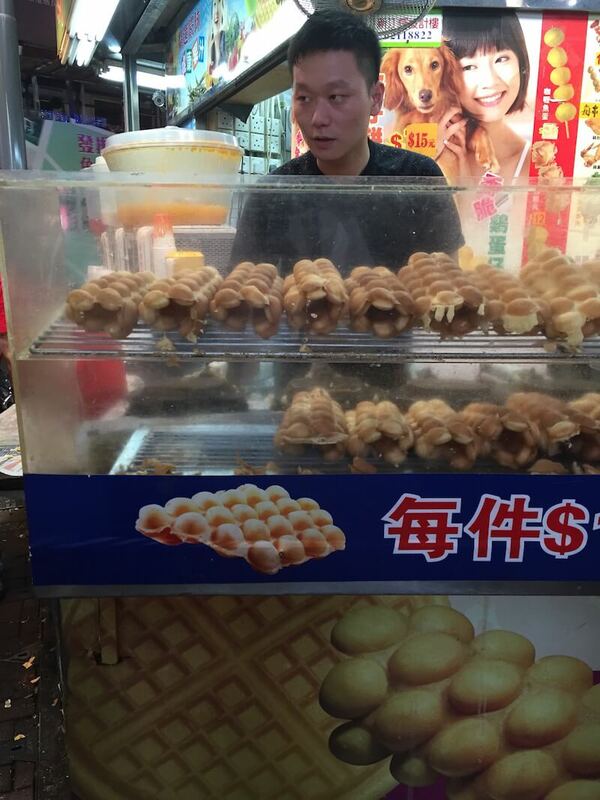 A nice way to end an evening is making a stop at one of the many carts that specialize in little Hong Kong Bubble Waffles (akin to waffles, but break apart into little balls). With all the savory food options, it’s a nice way to satiate the sweet part of your palate. They are usually made to order and the little bubbles separated and put in a wax paper bag to eat along the way. Excellent when still hot. 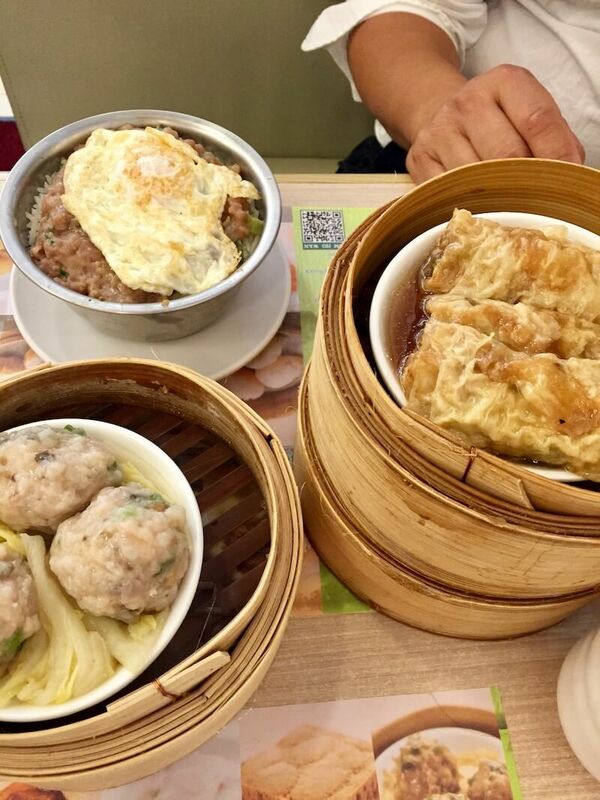 Tim Ho Wan is a dim sum restaurant that makes every Hong Kong Food Guide. The reason being is that it received an infamous Michelin star. Quite the honor for what many Hong Kongers consider a fairly run-of-the-mill institution. After a few encounters with this, we had smartened up and have coffee at Starbucks in the mornings, where there are napkins in abundance and stocked up for the day of eating. 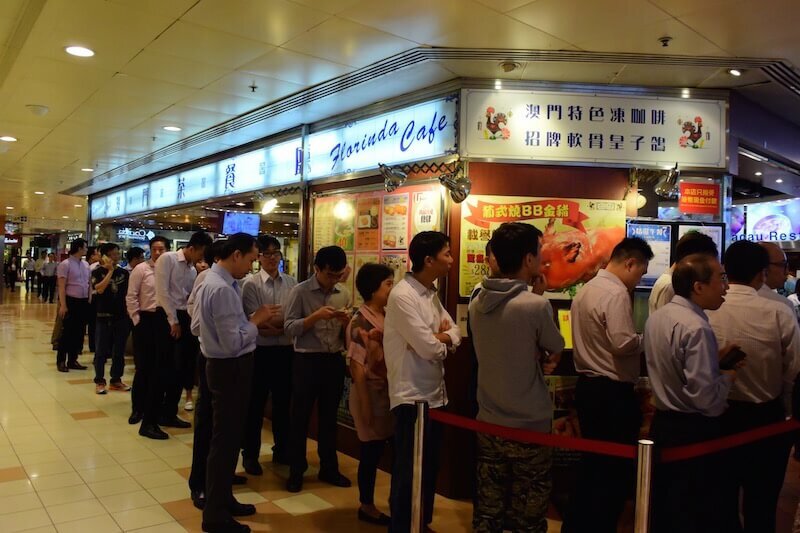 The service in Tim Ho Wan is almost non-existent. At this point, you are probably wondering why it has made it to our guide. 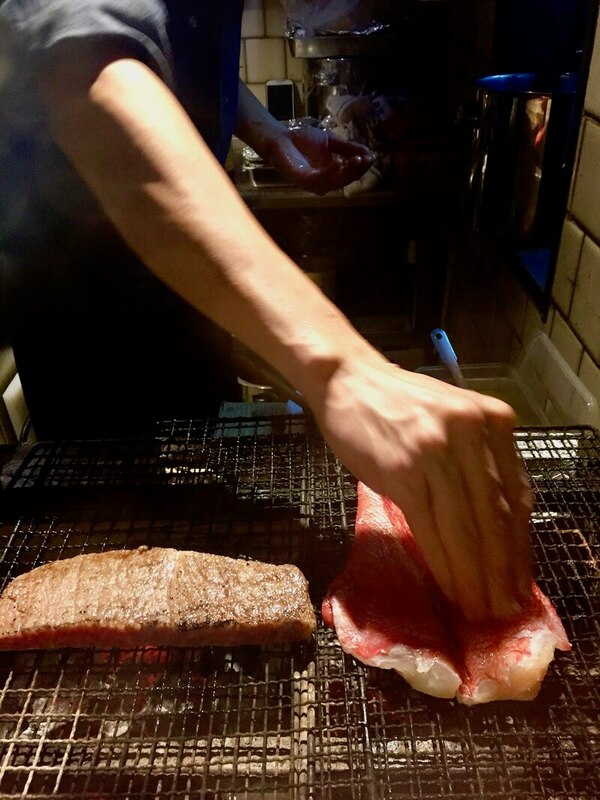 Well, when the food starts to arrive, you will quickly understand as to why it has received that coveted star that so many other, more refined restaurants, seek. (Refer to Brenda’s guide for recommended dishes). 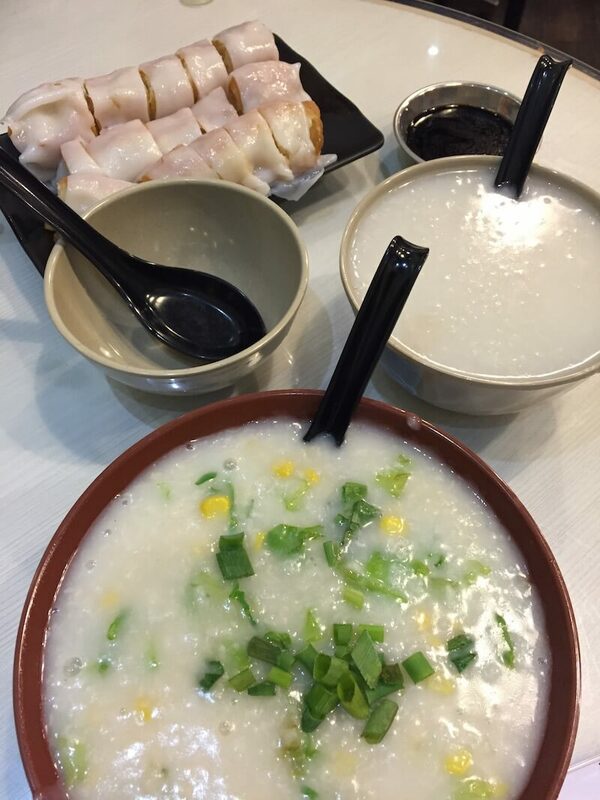 A typical option for breakfast in the mornings is congee (rice porridge). A restaurant named, Master Congee was highly recommended to us by a staff member of the hotel in which we stayed. There’s a huge cauldron to the right as you enter. It’s filled with piping hot rice porridge that continues to be looked over by one of the cooks. This acts as a base for your topping(s) of choice (and there are endless). There is a hustle and bustle in this place that is reminiscent of good diners in New York. There are the obvious regulars and the somewhat rude, but spot on, service. Congee is a sustaining dish and perfect for a day of sightseeing. It also gets to your table quickly, as to get you on your way. I kept it simple and opted for a raw egg (which cooks in the porridge) with some minced beef. There are also other non-congee breakfast offerings for those who aren’t in the mood for porridge; one of which is the deep fried crullers wrapped in rice crepe, my daughter’s favorite. Down a small street, which seems more like an alleyway, is a locally favored Ramen House called, Butao Ramen. The place is small, and there are limited editions of ramen concoctions served daily. Of course, this leads to everyone wanting to eat here, which inevitably creates a line of people. To facilitate the ordering process, you are given a card to fill out while waiting on line, so as when you finally sit, your bowls of ramen are at the ready. My daughter, self-proclaimed ramen expert ordered a traditional Tonkotsu Ramen, in which the broth so impressed her that she deemed it the best Ramen she’s had to date. Less traditional options include Pesto Ramen and Black Squid Ink Ramen. This place is worth the wait. Alex and Alfred Chang are twins, owners of Ura, and the two funniest and most knowledgeable food and drink people you’ll ever meet. They are high energy, passionate about what they do, and it shows in the execution of their place and menu. It also happens to be one of the hottest restaurants on an already sizzling street of fantastic food venues. Ura in Japanese means, “undersurface”. This establishment is located in a nondescript office building on Wellington Street in downtown Hong Kong. The sensibilities of design are impressive. 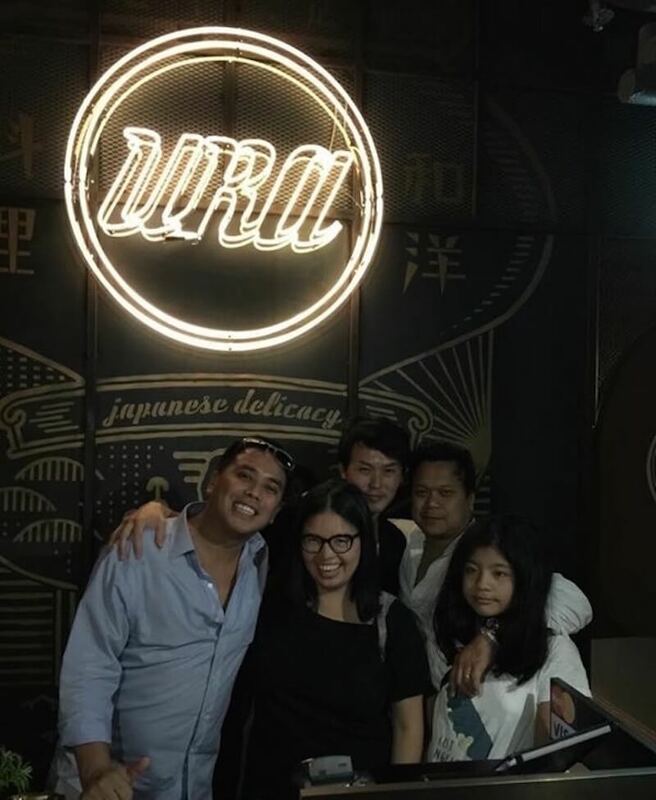 From the industrial feeling dining room to the artwork on the walls, combined with the very attentive and welcoming staff, few places can match Ura’s first impressions. Most come here for two things. Their whiskey and their Kobe beef. Urakasami is a sake brewing company that has been in existence since the 1700’s. This is a very limited sake, and in Hong Kong, it is exclusively carried here. They also offer a cask of Japanese whiskey that is, again, solely doled out by them. This serves as the foundation of the lightest and best highballs I have ever tasted. Not only is the whiskey superb but the dry soda they use is less sweet than the ginger ales we are used to in the States. Refreshing, to say the least. There are two versions of Kobe beef dishes available. First one is an onigiri version. 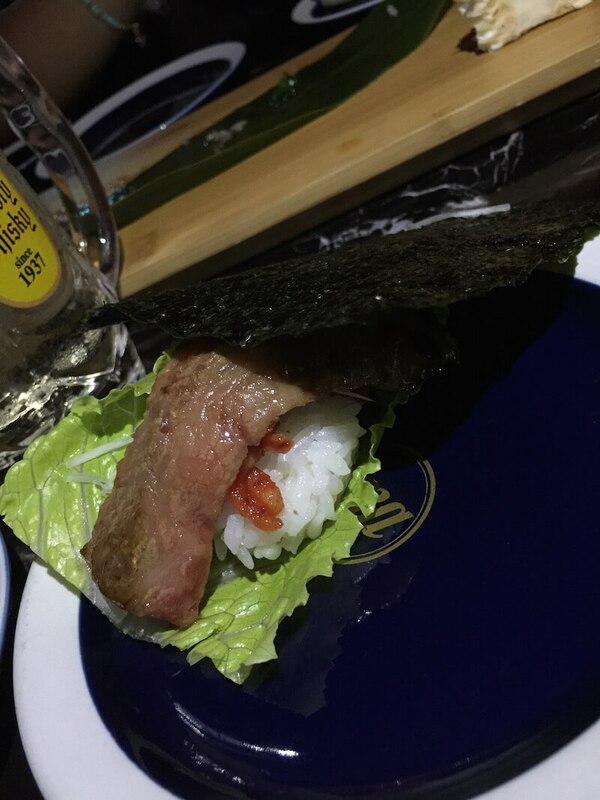 The marbleized, medium rare cook, is wrapped with delicious dry seaweed, with rice, a bit of pickled red pepper and lettuce. It melts in the mouth. The second, rare thin slices of rib eye on a sizzling skillet, where they leave it up to the eater as to the temperature they like their meat. There is a dash of soy-based sauce that gives it that umami which separates many Japanese dishes from other cuisines. If fish is your preference, there is a sushi and sashimi station, in which one can pick from that day’s market selection. And it is impressive, to say the least. For those who just want to pay a visit, there is an outdoor courtyard where one can lounge on chairs and enjoy one of their many drink concoctions. However, if you are eating, worthy of a try is the sweet raw shrimp and the raw corn. Especially the corn, which is offered only in season (July/August). It is shipped directly from Japan and to be eaten uncooked and served over ice. To date, the sweetest corn I have ever tasted. A true delicacy. If all this rawness isn’t to your taste, there are some cooked options as well. Try the chicken wings, from chickens imported from Nagasaki. It is simply prepared; lightly seasoned and quickly fried. Different from other chicken, it is a bit gamier and very soft. There are also meatballs made from a combination of shrimp and chicken. A real treat are the sweet onion rings, made from the onions of Japan’s Awaji Island (famous for two things, their draught beer, and onions). If you’re looking for a good time and good food, this is your place. 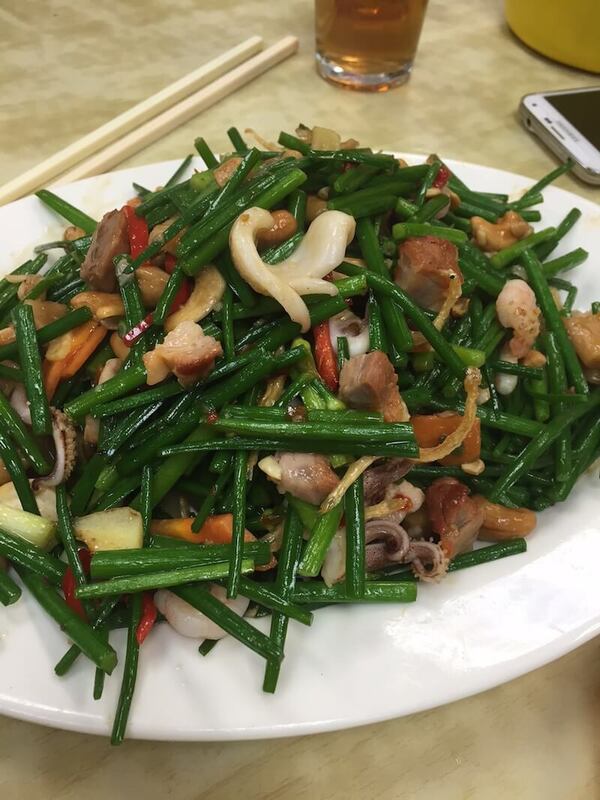 Other places to eat in Hong Kong are Cha Chaan Tengs, which are old school Chinese diners. There is one named, Tsui Wah where you should order their version of French Toast. 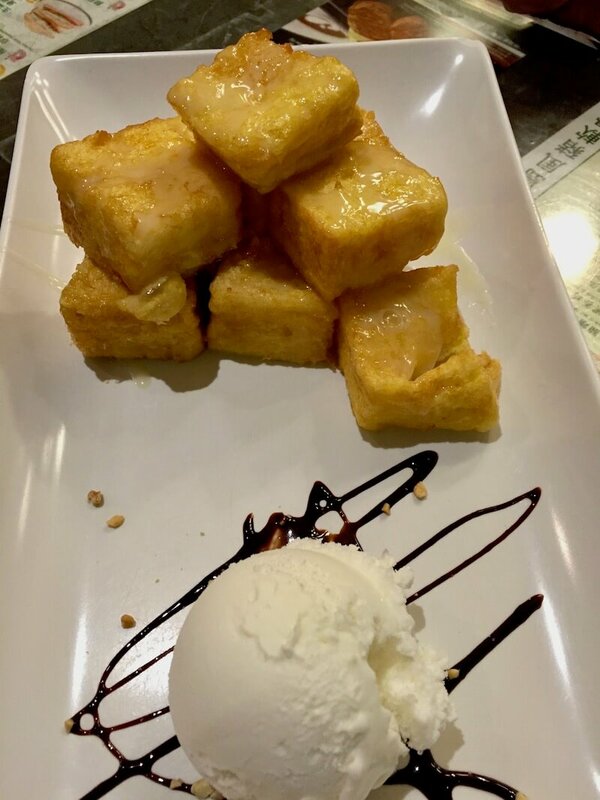 Their rendition is cubes of battered fried bread served with ice cream. A fun way to either start a day or end an evening. 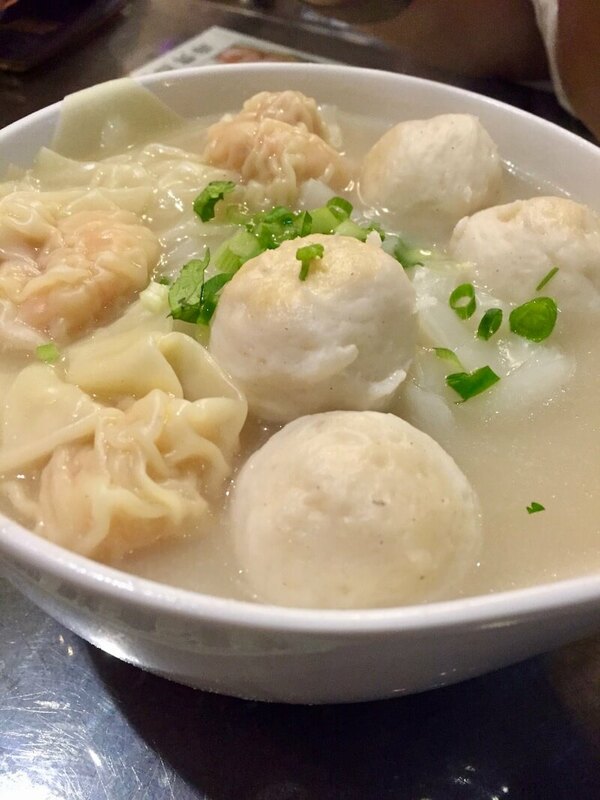 If you come late night to one of these Cha Chaan Tengs, you’ll find that you won’t be the only one enjoying this dish.
. The Portuguese arrived in Macau during the Age of Discovery and made a claim to the country for close to 400 years. The Florinda Cafe is a Macanese Diner and from the aesthetic and menu, the Portuguese influence is still very alive. 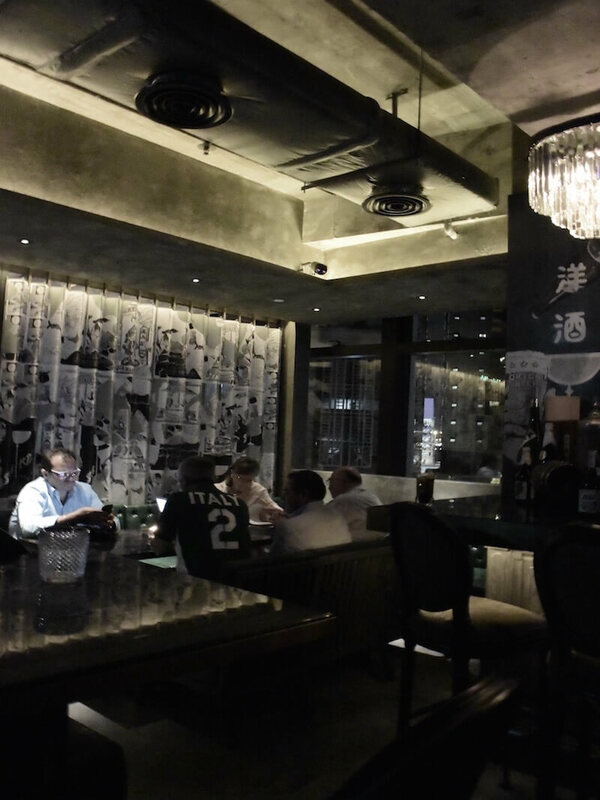 The restaurant walls are white tiled with artwork depicting the street names of Macau, in a style not unlike those you’d see in an eatery in Lisbon or Porto. 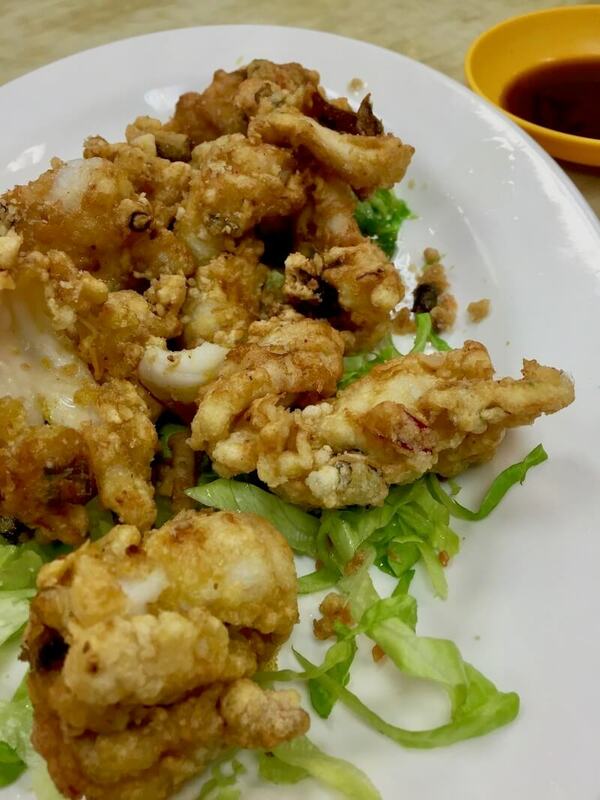 The dishes served here are a hybrid of Chinese and Portuguese cookery. Here we had butter toasted bread with condensed milk. Almost a direct interpretation of the “rabanadas” of Portugal, which is a common dish to have especially during Christmas. Being Filipino, I had an affinity for this dish, as I come from a culture, which too, has a cuisine that is influenced by western colonizers. The flavors were reminiscent of the type of french toasts my grandmother made for me in the mornings. I love food that makes me nostalgic. Another fusion dish worth trying is the elbow macaroni soup. This soup had bits of “spam-like” bits, carrots and onion. The spam is somewhat expected, being in Asia, but the flavor of the base stock was akin to a pot au feu versus something truly Asian. There is a Carne Guisada with potatoes offered on the menu. This best represents the coming together of two food cultures. In lieu of typical cubed beef, the use of beef tendon was applied. The density was typical stew, but the palate read more Chinese than Portuguese. There was a healthy dose of star anise and soy in the base as opposed to tomato. More of a five spice flavor versus sofrito. 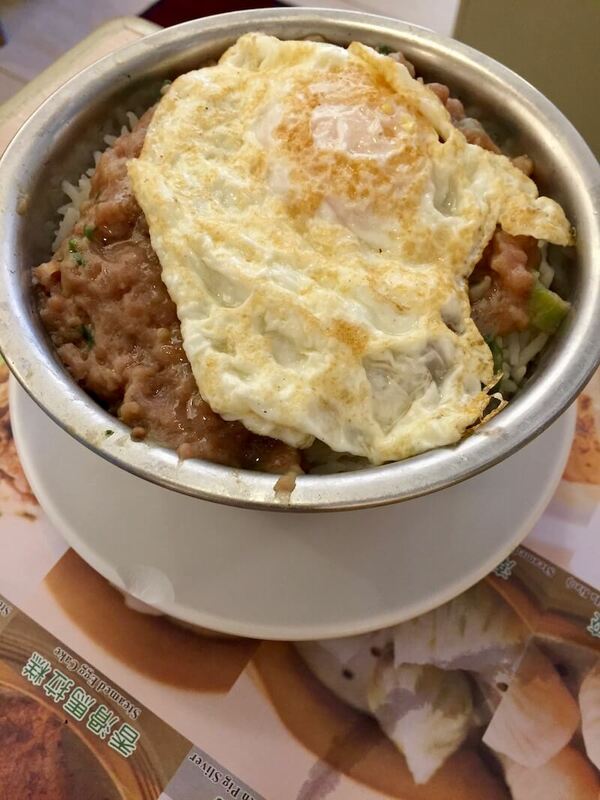 Lastly, there is the Macanese favorite which has no link to Portugal whatsoever. It’s a stir-fried noodle dish, using instant noodles. Yes, like the ones in the cheap ramen packets we used to eat by the dozens in college. The noodles were elevated with the addition of spring onions and beef. Don’t leave without trying this one, it’s a winner. Many locals will tell you that the Best Food in Hong Kong is found in the Wet Markets. Shirtless men, caged frogs, and fish of all sizes line up the wet markets of Hong Kong. Most of these wet markets have vendors set up on the top floor, serving up some of the best and most affordable food in Hong Kong. Using, for the most part, ingredients available downstairs. Our good friends took us to Sheung Wan Market in Central Hong Kong. 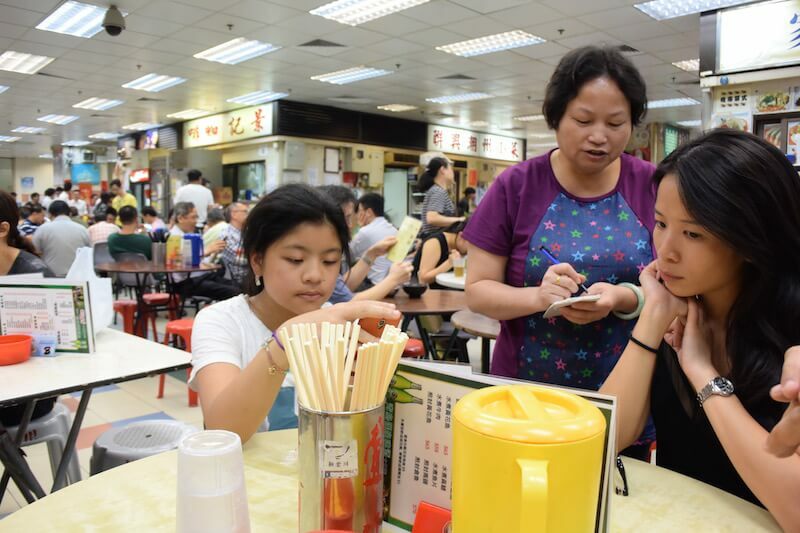 Visiting the eateries at the wet market is an experience that cannot be missed. 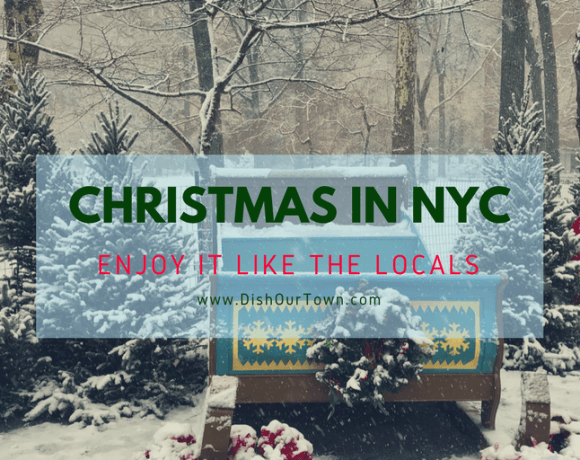 You can order from many different vendors; more often than not, share a table; and lastly, tastes some of the finest cuisines on the cheap. 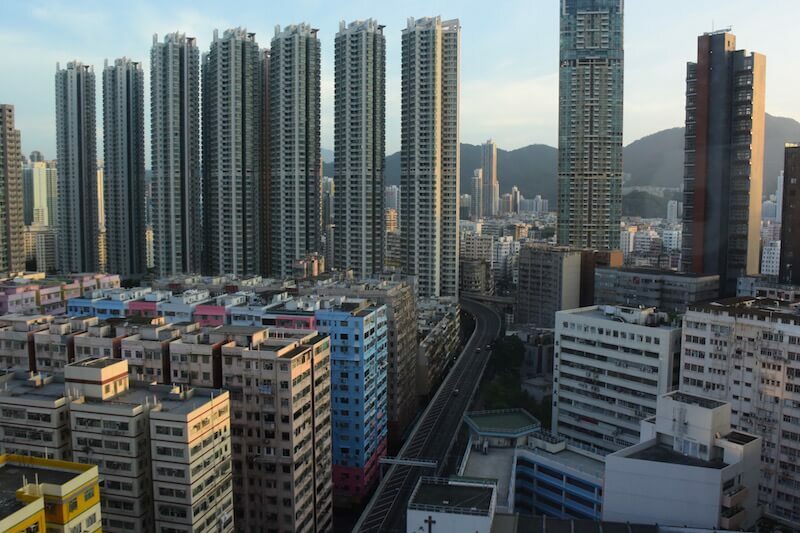 More importantly, these institutions anchor the Hong Kong of old from floating away. For less pedestrian choices there is Azure for drinks. 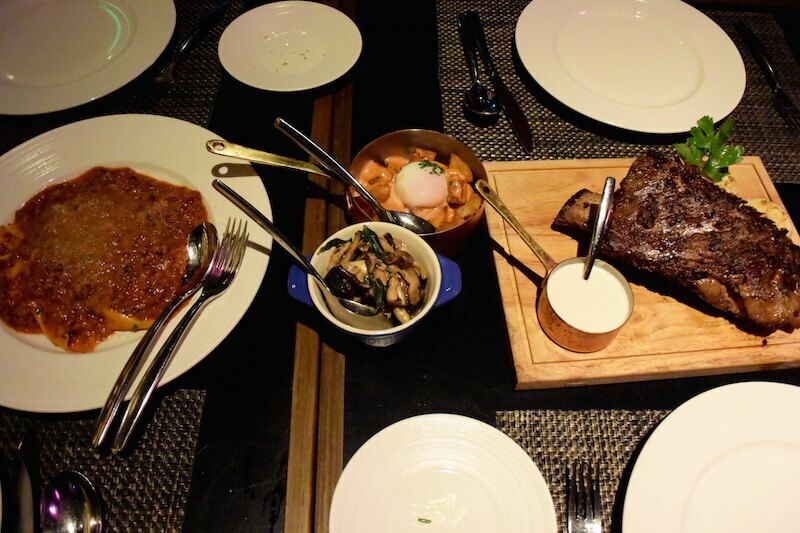 For steaks, there is the Penthouse by Harlan Goldstein. Both establishments existing in skyscrapers. While drinking Old Fashions and dining on Steak and Foie Gras, one can experience the ever-growing and very lit Hong Kong skyline. A Sunday can be spent lounging on the plush couches at the bar in the Intercontinental Hotel. It’s an expats hideout and a pastime tradition. Just about anywhere you sit, you’ll have an excellent view of the harbor. This makes for a great way to end a weekend. In my case, it was the way I ended my trip. It was a far cry from the romantic visions I had of smokey alleyways, but who needs that? We highly recommend Cathay Airways for one reason; the food is not awful and they have unlimited servings of cup o’ noodles. It’s not healthy, I know, but it keeps Bailey and Andrew very happy for the 14-hour flight. We also absolutely loved the entertainment on board and the staff was so helpful. The seats are still a bit small and legroom super tight, which is why I would recommend frequent walks up and down the aisles and to wear compression socks. 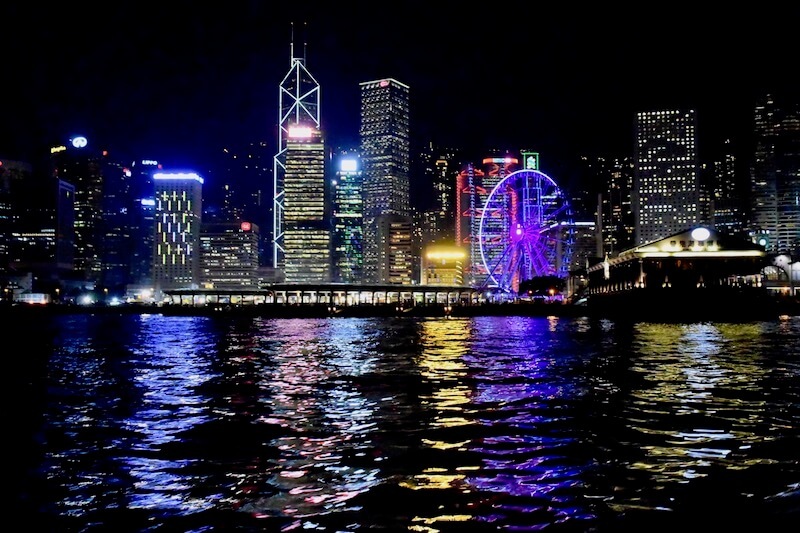 Related post: Here’s The Best Cheap Tours and Activities in Hong Kong. 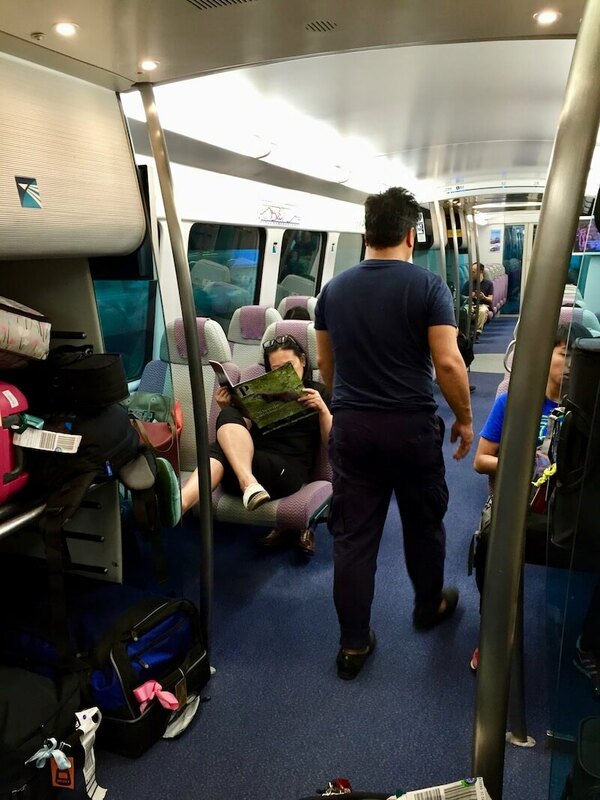 Once you land, make sure to grab a free cart for your luggage because you can take it all the way to the Airport Express. The Hong Kong International Airport is a very convenient and efficient airport. Once we landed, the first thing we saw was a booth for Airport Express, which my brother-in-law told me about and he was right. It’s simply the best way to get into town because it’s fast and happens to be cheap at 70 HK$ for adults and 45 HK$ for kids (which is about $9.05 per adult and $5.80 USD) to Kowloon, which is where our hotel was. Once we got out, we found a Citibank ATM right away. The best exchange rate is to withdraw cash and not go to a currency exchange. Once we got a bit of cash, we followed very clear signs to the Airport Express. Our stop was Kowloon which is where our hotel was located, from there we took a short taxi ride to the Dorsett Mongkok 88 Tai Kok Tsui Road Kowloon Hong Kong. We chose the Dorsett because it’s a more off the beaten path location. Where more of the locals actually live. We love hotels, this one is a boutique hotel which is great. It’s got more personal service and was convenient to public transportation. We also loved that the Dorsett Mongkok provided us with a phone with free calls and data during our whole stay, which came in very handy while calling our friend to meet up. It was also very convenient to have for google maps when we got lost (all for free). 3 of the 5 nights we were there, we used the gym, which was great because we ate way too much. Hong Kong’s MTR (Mass Transit Railway) is the most convenient way to get around Hong Kong. It’s clean, convenient and efficient. They have easy to read maps and directions and all the transit workers are extremely helpful. From the Dorsett Mongkok Hotel, the best stop was Olympic Towers. We, on very few occasions, used taxis as well, which was convenient on late nights. There are several locations but we went to the one close to us. Go early. We went at 10 am and there was no line. 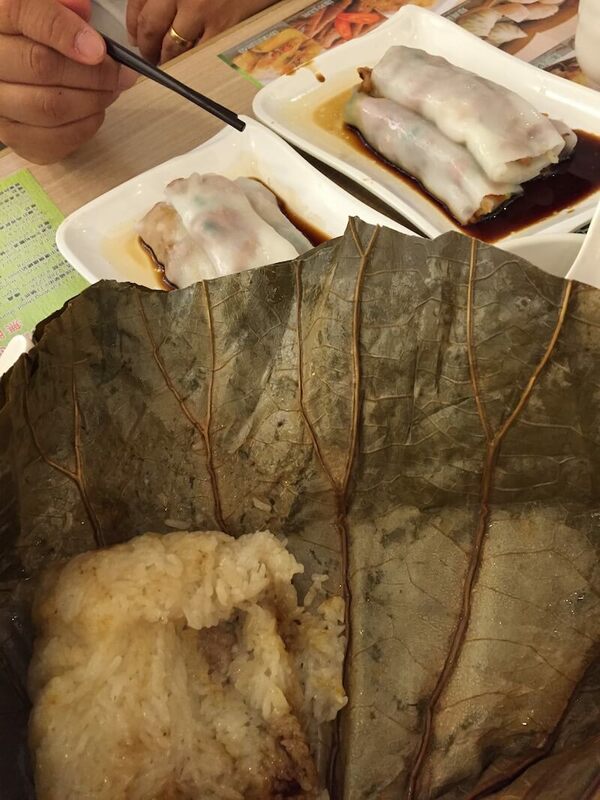 Our favorite dishes were sticky rice and the rice vermicelli. This place was right on the street perpendicular to the Dorsett Mongkok. It is a great place for breakfast. We went there almost every day. Bailey’s favorite is the fried cruller with white noodle. 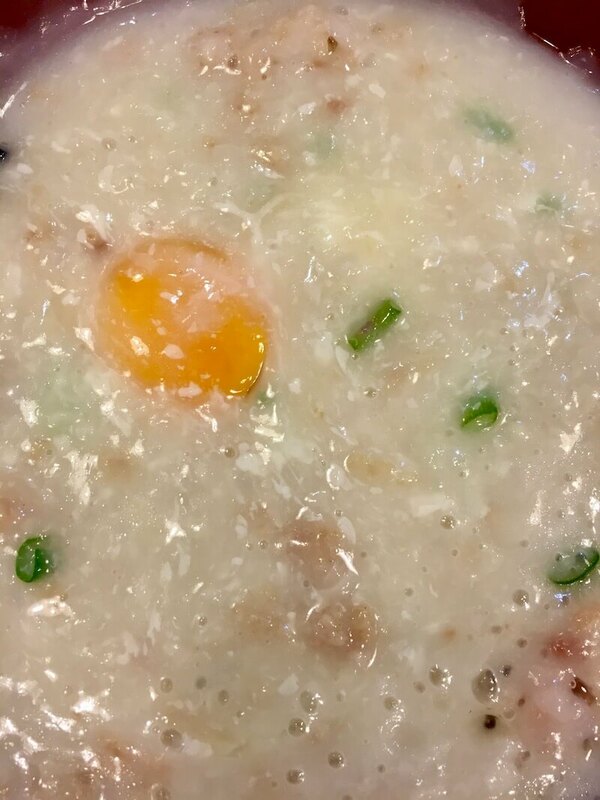 Our favorite congees were: congee with chopped beef & egg. Also loved the congee with lettuce corn and abalone. Wendell’s favorite ramen house in Hong Kong is Butao Ramen and Bailey agrees that it is excellent. Our favorite ramen was the squid ink. 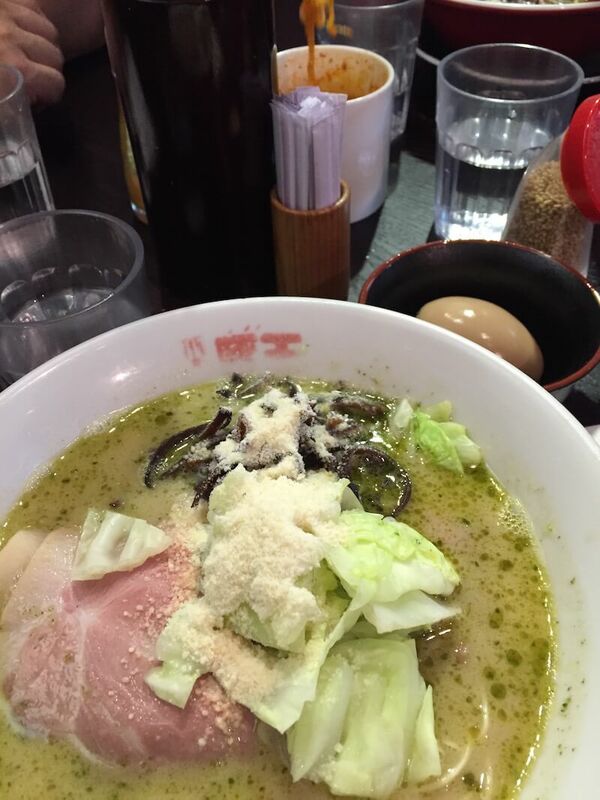 Bailey’s favorite is the Butao ramen. From the Dorsett just cross the street and make a left. She is the first roast meat stand. Have no idea what the place is called. Our favorite was the roast pig here. He was at a corner near Butao Ramen in Causeway Bay. A hidden treasure. A very special restaurant in Hong Kong. One must experience this joint at least once. Macanese restaurant. 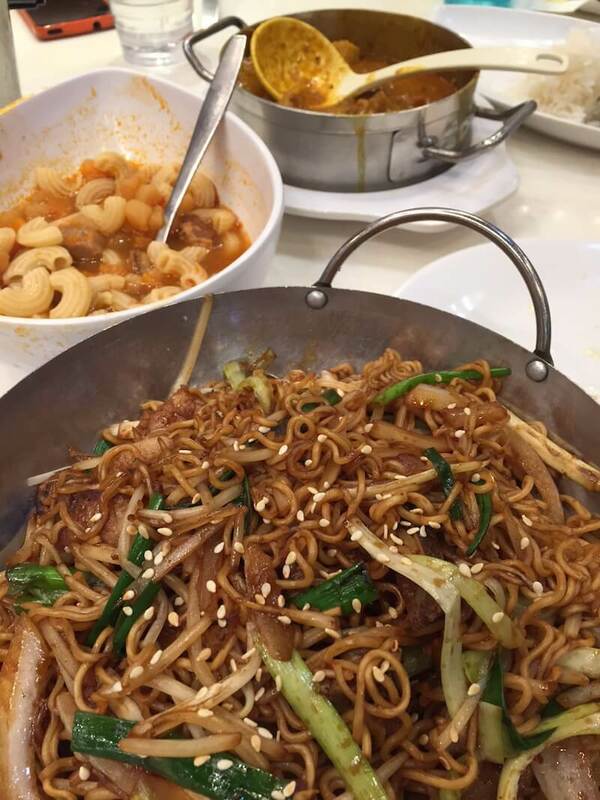 You must get the curry and the stir-fried instant noodles. Get the Short Rib, enough meat for 3 adults and a child. We also liked the potatoes with egg very much. Intercontinental is located on the Kowloon side of Hong Kong and is a great place to have drinks and snacks while looking at the skyline. There is a great service that the MTR provides in Kowloon, which W and A, our local friends tipped us off about. Our hotel, Dorsett Mongkok Hotel, has a free shuttle to the Kowloon MTR stop and at the MTR stop, there are airline counters lined up where you can check in your luggage. At the Kowloon station, there are also plenty of luggage carts. There was basically nobody in that station checking in, it was the smoothest, quickest check-in we’ve ever experienced. After we checked-in we jump right into the MTR towards the airport with no check-in luggage, just our small backpacks. When we arrived at the actual airport, we saw a HUGE line to check-in while we just casually strolled in. So, definitely go to Kowloon to check-in, well worth your time. PIN IT TO YOUR FOOD & TRAVEL BOARDS! Food looks amazing. What was your favorite dish you ate that you had never tried before? Our favorite dish we’ve never tried before was the frozen corn from Ura! I know it sounds simple but I’ve honestly never had a more delicious corn in my life! Thank you for reading Alexa! great article. I love Hong Kong. Such a mix of british and chinese culture. Thank you. It really is a great city and the fine mix of the cultures you mentioned. I love it and hope to get back there quickly. Thanks for the read and hope to hear from you again soon. I too was inspired to visit Hong Kong by the movies–kung fu movies! It was a fabulous trip with food being a highlight. Thanks for the mmmm-memories! Ahh… Those Kung Fu movies. I used to rush home from church on Sundays just to catch these on television. They would always show them on a Sunday, don’t know why. Thanks for sharing your why you were inspired, moreover thanks for giving us a read. 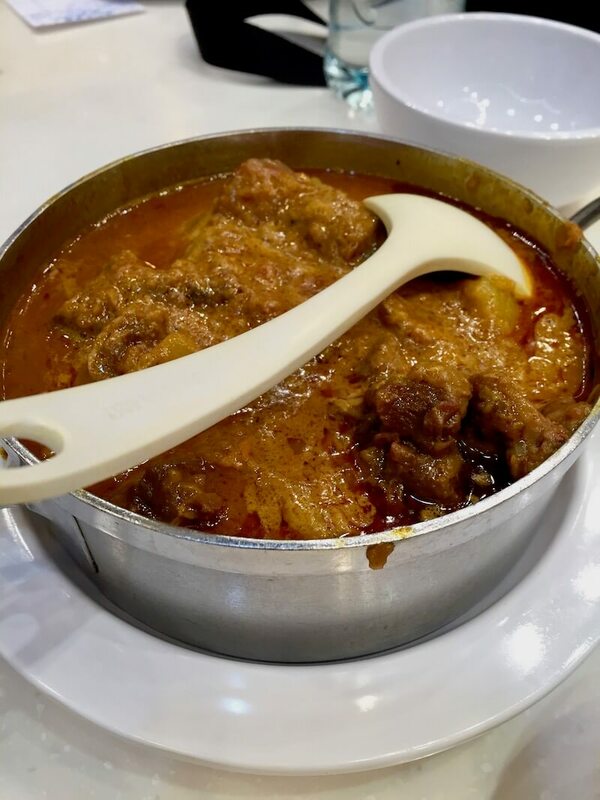 With so much to explore, I’ve not really thought of travel to Hong Kong but after reading your post I want to visit simply to eat some of that food. It sounds like Jowie pointed you in the right direction. Can’t wait to read more on your RTW trip. I felt the same for a long time. Glad my visit not joy changed my mind but yours as well. Hope to continue to tempt you with the food we will be trying. My first time to your blog! Now I know not to read when hungry. 🙂 I look forward to following your RTW! Welcome, and thank you for logging on. Hope we can continue to make your mouth water. 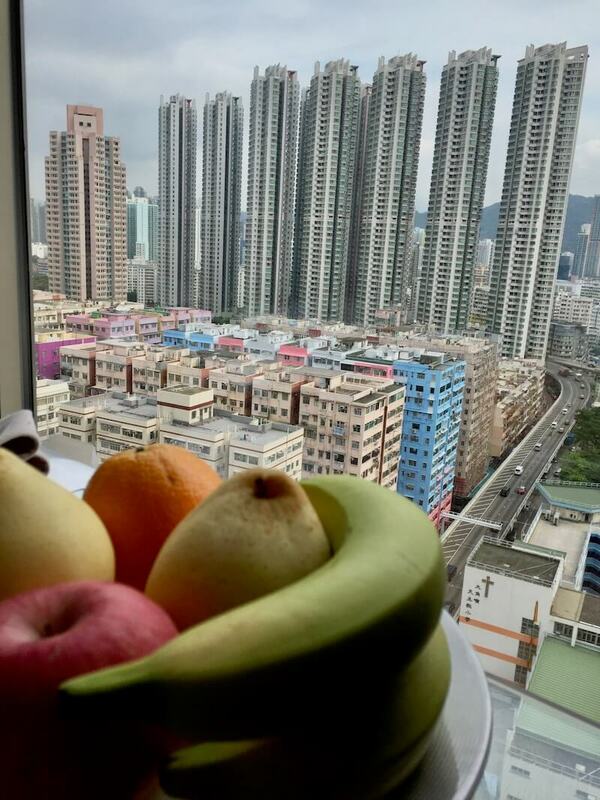 So glad you got to experience Hong Kong from the Tai Kok Tsui neighborhood! It’s certainly more local compared to the main tourist areas like Causeway Bay, Tsim Sha Tsui and Mong Kok. I actually live like, 2 blocks away from the Dorsett and often grab breakfast from Chef Congee.